Take your design process to the next level by testing it in a virtual real-world environment. Spend more time designing and less cost on prototyping. Evaluate the efficiency with SOLIDWORKS Suite of products, make improvements and boost your product innovation with durability, static and dynamic response, assembly motion, heat transfer, fluid dynamic and plastic injection molding. SOLIDWORKS Simulation Standard gives product engineers an intuitive virtual testing environment for static linear, time-based motion, and high-cycle fatigue simulation, so they can answer common engineering challenges with this SOLIDWORKS 3D CAD embedded solution. The Trend Tracker capability and Design Insight plot enable designers to highlight optimal design changes while they work. Built on a concurrent engineering approach, SOLIDWORKS Simulation Standard helps engineers know if their product will perform properly and how long it will last. Linear Stress Analysis Calculate stresses and deformations of parts and assemblies due to internal and external loads to validate product performance and safety while you design. 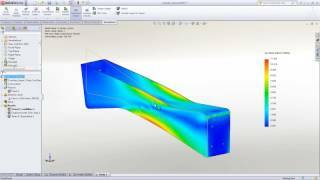 Finite Element Analysis (FEA) Use finite element analysis (FEA) to calculate stresses and displacements of parts and assemblies under internal and external loads. Fatigue Analysis Fatigue analysis examines how repeated or random load cycles can cause structural failure (also known as metal fatigue). SOLIDWORKS Simulation enables designers to take two, complementary approaches to design analysis: Design for Strength and Design for Life. 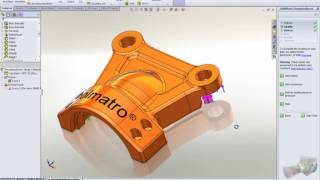 Motion Analysis SOLIDWORKS motion analysis uses the assembly mates along with part contacts and a robust physics-based solver to accurately determine the physical movements of an assembly under load. With the assembly motion and forces calculated, a structural analysis of the components can be performed to ensure product performance.